I’m a visual learner. I mean, I owned a copy of Patterns of Fashion for years before I ever looked at the words. (I’m not even kidding. Turns out the words are pretty useful too!) If you find yourself in the same boat, this might help. 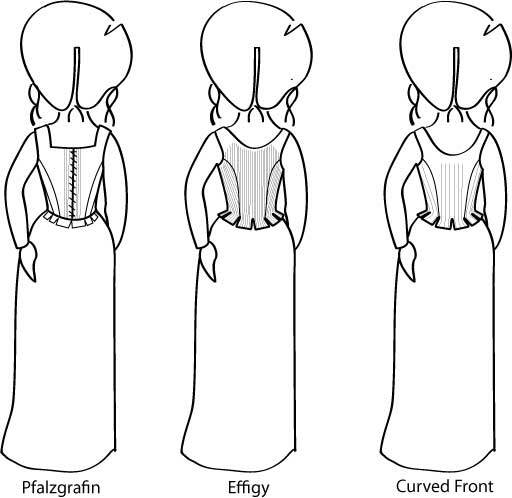 It’s a set of line drawings of the Pfalzgrafin and Effigy corsets, as well as my cheater curved front corset, lined up side by side for easy visual comparison. 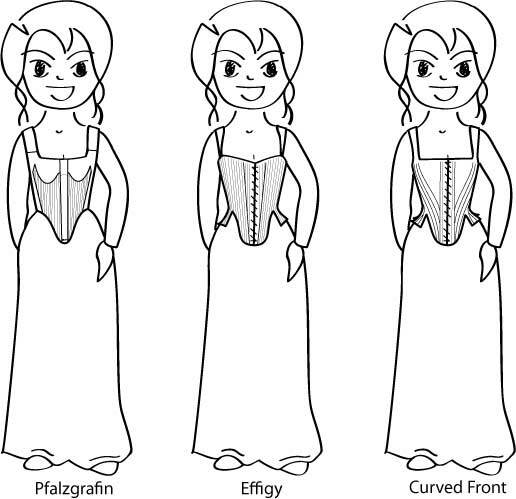 Em is wearing a Pfalzgrafin corset (left), an Effigy corset (center), and a curved front corset (right). I’ve drawn in all the seams (heavy lines), and indicated the boned areas and boning direction (littler lines). I showed less boning on the curved front corset, mostly for variety. I’ve tried to show how the body distorts the lines of the boning. The same corsets, the same order, from the back. It was faster to do this all with graphics using Em than it would have been to do it in cloth with Lizzle, but only just barely because Illustrator and I do not get on so well. Also, line drawings are slightly more clear than photographs sometimes. 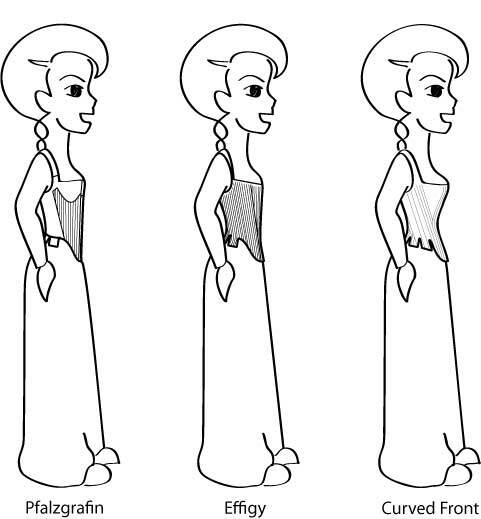 Same corsets, same order, from the side. This is really where the biggest difference in the silhouettes is. So, there you have it. Your corset affects both your silhouette and your comfort, so it’s important to know your options and choose wisely. This was incredibly helpful, thank you so much! I am trying to start work on a corset that I can use to build late Tudor and early Elizabethan gowns over, and your website has been indispensable! I’ve started and scrapped way too many to want to make the same mistakes again. Would you mind if I credit some of your tips and link back to your site on my blog as I chronicle my thought process? Once again, thanks for all of the drafting tutorials and examples! so if one is short-waisted, with a proportionally smaller waist and underbust/ribcage and larger bust– then the B or C corset would be better?? ?